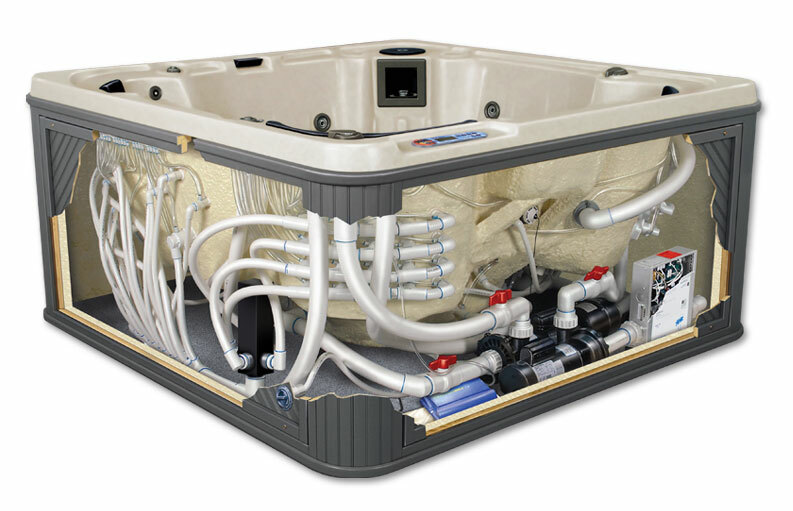 Hot tub troubleshooting usually involves isolating an issue down to the component in the spa that is causing it. If there is a leak, then finding the source of the leak is the first step to replacing any plumbing parts. In spas with fully foamed cabinets, this leak-finding can be quite time consuming, cumbersome and expensive. Although it was easy for that hot tub manufacturer to blast the inside of the shell with polyurethane or other foam, it is not so easy to dig it out in order to find a leak. Some hot tub technicians maintain that by foaming the spa full, as the foam slowly expands further over time, it may even cause a leak. In any case, the more service–friendly type of spas are those that allow access to all areas of the spa by insulating shell and cabinet, but not the dead air space in between. There is no empirical evidence that one insulation method is superior to the other, as one of the most important energy saving factors on the spa is the actual hard cover thickness. As heat rises, it is important to contain the heat that wants to escape out of the top. For the extreme energy conscious, there are even floating spa covers that float right on the surface of the water and create another dead air space between the floating cover and the underside of the hard cover. This works similar to the principle of double-paned glass with a dead air space. This type of insulating will certainly reduce electricity consumption. Once the faulty component or location of the leak has been determined, the repair is carried out. Most plumbing parts for a spa only cost a few dollars, so the labor is the most expensive part of that repair, and digging out foam is unnecessary labor that increases repair bills in the event of a leak. Other components such as pumps, blowers, ozonators and even entire spa packs, can usually be swapped out in about 10-15 minutes by a skilled technician.